As a ten year old it was hard for me to understand John Carlos and Tommie Smith standing on the Mexico City Olympic podium with outstretched, clenched fists. Figured it out as a twenty year old. Met Tommie as a 50 year old. A whole lot of freedom of speech being talked about again with kneeling during the national anthem. The universities standing behind our dissidents as it should be. As a blogger and a veteran, I fully support peaceful protest as part of that basic right. Our USATF Nebraska Assoc. XC Championships are set for November 13th at Walnut Grove. Teddy Mitchell is running for Men’s National LDR Chair. He was on the 2000 World Champs Half Marathon team I took to Vera Cruz, MX. He has reached out asking me to second his nomination in Orlando this December. Women’s LDR Chair Kim Keenan Kirkpatrick picking Linda’s brain this morning on our Athlete Development Program. Pete is past the 1200 mile mark, breezed through Ft. Collins yesterday. I’m nominating him for the USATF Ultra Runner of the Year. This entry was posted in Uncategorized on September 30, 2016 by runguru. Seth Hirsch wins Roy Griak Invitational. That’s some mighty big news. His post race interview telling and mature. Leads the Millard West Wildcats to third overall. Great work by Coach Colin Johnston. This entry was posted in Uncategorized on September 29, 2016 by runguru. Hope you caught the opening act of the circus. The two headliners running roughshod over The Invisible Man, moderator Lester Holt. Silliness abounds! The Real Dangerous stuff followed. Each news channel’s political pundit putting the spin they wanted you to believe. Don’t you believe it! Only seeing is believing. I gave Linda an analogy this morning. How one person can so corrupt the truth, put such a charming spin, smiling out one side, sneering out the other, all dressed up on the outside, purely rotten on the inside. Absolutely convincing to the weak, the malleable, the lost, the lemmings. With no basis in reality. My tomatoes nearly done, I’ve sold 2642 pounds and cooked down another 300 pounds for the coming year. 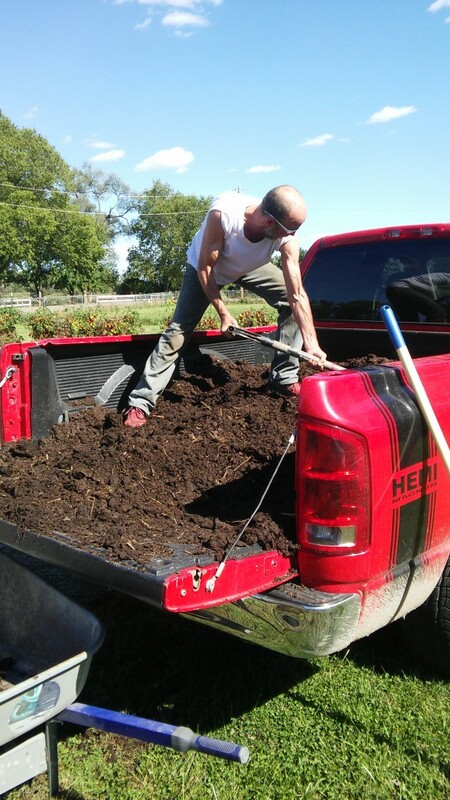 Now recharging the soil with some manure ordered from Churchill Downs, no sh*t! My 15 years of working with Nebraska USATF LDR allows me to stand right in the middle of it and not sully my white t-shirt. This entry was posted in Uncategorized on September 27, 2016 by runguru. Right off the top I’m owning it. Corporate Cup top finishers Grant MacKinnon (1st- 33:45) and Brandon Wissing (2nd-34:10) do indeed run for Nebraska Run Guru Elite, Inc. My bad for not getting Grant his kit and making sure our boys were outfitted properly. Both new to the club, we look forward to their representing with distinction! Tough hilly course. Winding and winding. Good to see Colin Morrissey (3rd- 34:25) and Tim Langdon (5th- 35:40) of Team Nebraska and Erica Doering (1st-39:26) of Lincoln Running Co. Racing willing to get some. Logan Watley LRC (6th- 35:44) also represented the blue and yellow. NRGE’s Stacy Shaw (1st master 44:11) showed that at 50 years old she is still wears the badge. Now hear this! 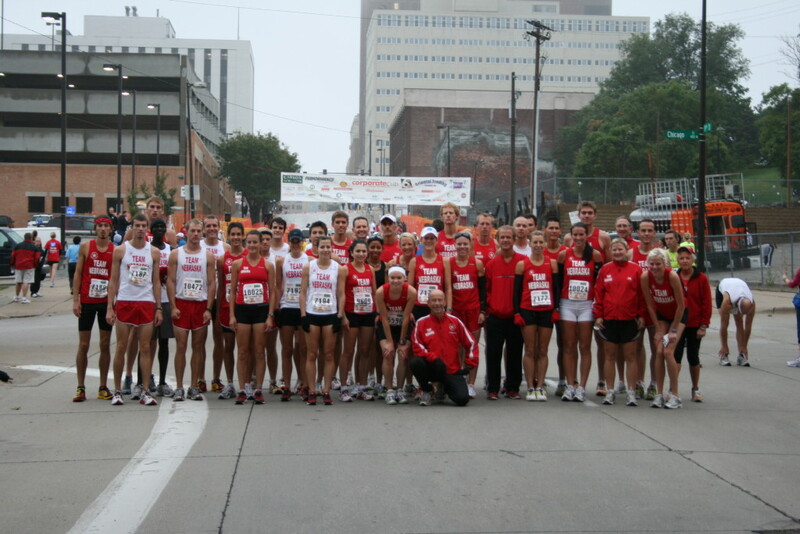 The Omaha Corporate Cup was the most important 10K in the state of Nebraska from 2005-2012. Depth of competition, race times, prize money. It took me years to get the race to that level. And only a moment to drop into irrelevancy. But Wait! Grant and Brandon have thrown down the gauntlet. A huge step forward to making the race a race again, despite the most difficult 10K course in town. Those darned professors! You would think that with their horned rim glasses and ivory towers they would be smart enough to schedule projects and exams with enough notice so that our lads can meet arbitrary entry deadlines. No excuses, no leeway. No race. Say what? Our lads found out in the last 10 days that they would be available to team up for Market to Market. I was fairly salivating at the prospect of NRGE taking it to LRC and Team Nebraska. Almost giddy as we reached out in hopes of securing an elite entry spot. Too bad, so sad, entry deadline into Nebraska’s favorite novelty passed. So with that, Nebraska’s fastest male and several of his mates will be racing in Omaha the following day. The Race for the Cure 5K, here we come, late entries and all! 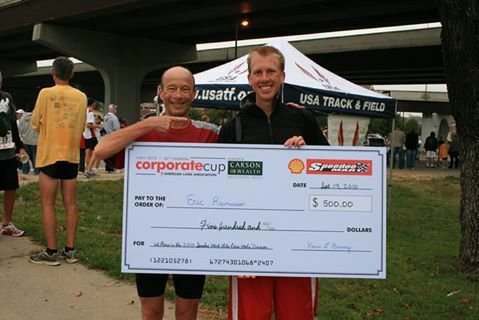 This was the Omaha Corporate Cup during my heyday. Took a Force of Will, Real Leadership, to assemble athletes from across the state and get them on the same page. Our Nebraska Association 10K Championships. We all will have to work hard to see the likes again. Decent payday for Eric. Where did all the prize money races go? This entry was posted in Uncategorized on September 26, 2016 by runguru. I do declare that running is my business. I wade in and weigh in, often unsolicited. Such was the case this past weekend. I’ve been following a high school friend on fb, his son Jake just turned 14 and has run 18:05 on a certified course. I of course thought that was keen. Read where the young man ran a recent good 15K and was looking forward to a half marathon in the next couple of weeks. I couldn’t just stand by. Called my hometown, spoke with his dad. Gave him my position about too far too young. Urged him to sit the lad down and present sound logic. Not everyone agrees that year round running is inappropriate for developing youth. There are those that thumb their noses at me and the notion in fact. Parents that push their children too far, too fast, too young. Back to Atwood, IL, I told Jim that Jake would undoubtedly perform well in the half. And that would ultimately be detrimental to his psyche. Success at too young an age. Setting a high bar that leaves little room for appropriate incremental development, lots of room for burnout and injury. Push them as hard as you can as a child and you will see results. I doubt though that you’ll see them in the sport, at least competitively, as adults. Pete Kostelnick keeps chugging across America. Yesterday was day 11 and he covered 72.5 miles. He’s out the door already and will post another 70+ while you are in your cubicle. 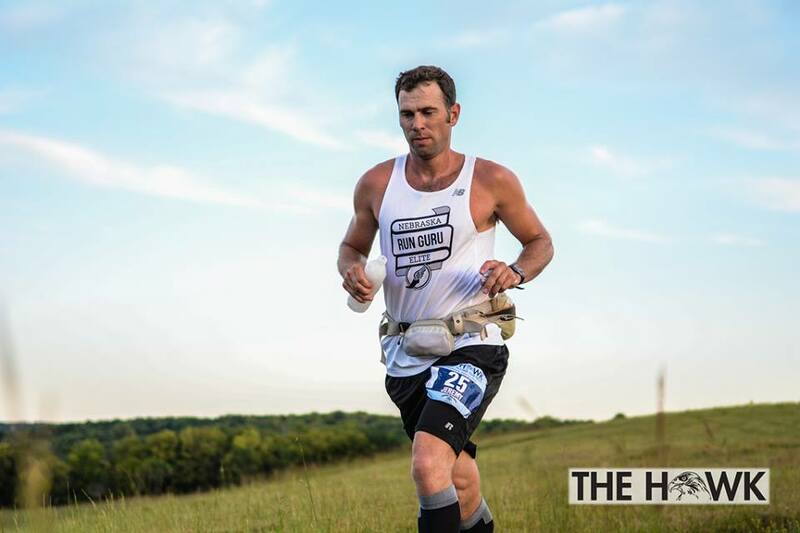 Jeremy Morris set the event record at the Hawk 100 Mile in 16:12:36. You guys amaze me! This entry was posted in Uncategorized on September 23, 2016 by runguru. When I wasn’t running my mouth during the Freedom Run Half Marathon lead bike duties it was very introspective. Blood coursing along retired pathways. Easy pace reminiscent of recovery days of yore. The leader, at 50+, mature enough to take or leave my easy banter, making it peaceful for 1:22 and change. The morning sun and perhaps the gods themselves gifted me. As I rode along, the shadow of our leader struck perfect juxtaposition. Same height and weight as me, same stride length, same turnover rate. I drifted off to a Reverie. My Shadow, My Stride. Running again. Easily and fast for an old man. It was Real. My Reward. For a Lifetime of Service. Run Runner! Run! This entry was posted in Uncategorized on September 22, 2016 by runguru. This line, this Platte River, Ni-Bthaska-Ke the Omaha Tribe name for the meandering tributary. To the west, an air of superiority. That’s the climate. Ask most anyone from the Lincoln running community about Omaha’s efforts and you’ll get a chuckle and a chortle. A belief held deeply and for decades, attitudes shifting along with the Capitol building. Those lines, they are drawn deeper than the river. I’m going into the vault when I tell you of my first couple months in Nebraska. Going to an ORC Board meeting and describing a different vision. Not at all well received, I pronounced my intentions to proceed alone. Team Nebraska was the result. Foisting competitive athletics onto this bastion of social, comfortable, RRCA. Advocating prize money over participation medals. I was told Lincoln was the answer to my needs. But along the way, a highway that still runs west, mostly in the memories of Stenger and Wilson and Westhuizen and Adams and Lindgren and Kunasek, was laid. A link now buried under shifting time. Damage along the river, like all things, will eventually pass, I’m an optimist, and the best will join together once again. Congratulations to Ann Ringlein on her induction to the Nebraska Wesleyan HOF. She has few peers in Nebraska. Back to the Omaha Marathon, Saugerties style. Shooting on the course by a semi deranged man delaying the start into the heat of the morning. A $1500 generator was stashed at the half marathon point at 1 in the morning, time penny wise and pound foolish as it turns out. Stolen. Running through the mean streets of Omaha’s worst side. It’s been decades since Omaha has had a Real Marathon because they don’t support both competitive and casual runners. Lincoln does. Hard to Argue. This entry was posted in Uncategorized on September 21, 2016 by runguru. One or none? Appears that Shannon Mauser Suing isn’t a USATF Nebraska Association member. This entry was posted in Uncategorized on September 20, 2016 by runguru. Well that went worse than I thought possible, but still I can’t say I’m surprised. Our USATF Nebraska Association Marathon Championships had a grand total of 1 competitor. No men, only one female, Shannon Mauser Suing of Gretna. Lincoln runners won’t run races in Omaha. One Team Nebraska athlete, zero LRC Racing and zero NRGE runners. NRGE did perform well in the half and 5K however. So y’all have spoken and I’ve listened. When I moved here in 2001 I was shocked and dismayed at what I called the “Abyss”, the gap between Omaha and Lincoln running communities. The Platte River may as well be a million miles wide. I built Team Nebraska to bridge that disconnect. And it worked while I was riding herd. Brought athletes from every corner of the state together. It took an extraordinary effort. That was then, ending in 2012. The Division stands, perhaps wider now than ever. My answer is leadership. What’s yours? This entry was posted in Uncategorized on September 19, 2016 by runguru. Having a beet smoothie with one of my beatniks. He’s not a runner but had some questions about marathoning. Here in Omaha. Me: Long time Race Director Susie Smisek came to ownership of the event and sold it to the HITS group. The Omaha Running Club and our community were merely stunned. Me: The ORC is hosting the Heartland Marathon on October 2nd. It will be the RRCA State Championships. The Road Runners Club of America embraces and celebrates the most social aspect of the sport. Me: Yes, October 16 with a sweet course downtown. Progressive, local response to the ripeness of the fruit, laying right on the ground is how I call it. Me: Yes. Little to nothing has changed in Omaha Marathoning in the 15 years I’ve lived here. The Omaha Running Club sticks to their culture and formula. Me: “The fact that HITS can trump us in our own streets speaks volumes. The fact that the Nebraska Marathon is establishing itself does too. Road racing is a product and the consumers speak with entry fees. Should be an interesting 30 days. Me: Here’s mud in your eye! This entry was posted in Uncategorized on September 16, 2016 by runguru.